With 10 frames, 3 fabrics and 13 color options, upholstery is the next step in Arteriors’ evolution – including a versatile mix of settees, chairs and sofas. Sophisticated designs that can be layered into a variety of rooms. From an elegant settee at the foot of a bed to a pair of chairs flanking a fireplace, Arterior’s designs add a layer of artfulness to your space. Each piece has been handled with the highest attention to detail. Handcrafted by artisans in the USA, the frames are constructed with FSC Certified, kiln-dried hardwoods that are sustainably sourced. 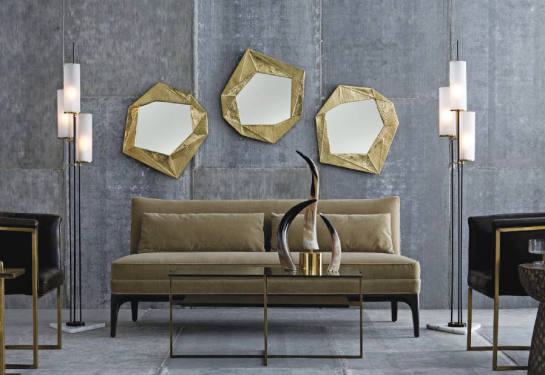 Arteriors will be stocking these designs to ensure fast delivery, but are also offering you the opportunity to select one of our luxe fabrics or leathers for a made to order piece. This inaugural upholstery collection is a natural extension of the Arteriors brand you’ve come to know and love. Enjoy!